This Marinated Steak and Broccoli has to be one of the easiest and healthiest weeknight dinners you can cook. If you prepare the marinated steak ahead of time, the total cooking time is just 5 minutes. My biggest challenge with healthy eating has always been getting enough veggies. I love almost every type of protein, but often find cooked vegetables to be boring. I am always looking for ways to make my veggies more interesting and that’s why this Marinated Steak and Broccoli is so amazing! 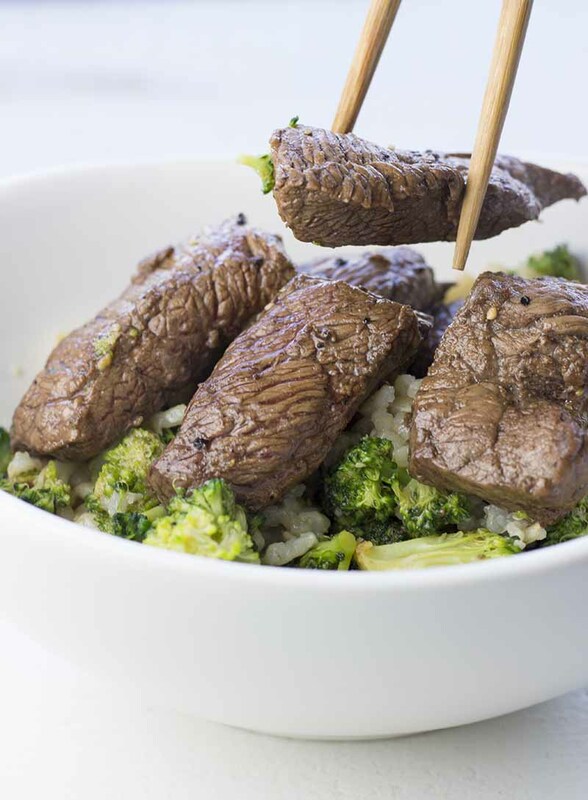 The genius of the recipe is that you cook the broccoli in the marinade from the steak, which means that everything tastes like marinated meat (not quite, but you get the idea). The broccoli stays almost raw, but it absorbs a ton of flavor from the marinade. 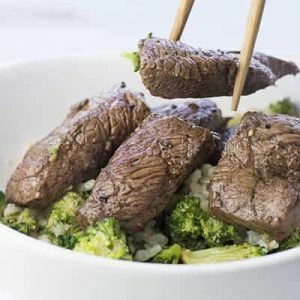 When you put everything on top of a little rice, quinoa, or something else that can soak up the marinade, you get a meal that is perfect for a healthy fitness lifestyle and where the steak and marinade flavor is infused into every bite. You can use this method with any kind of vegetable that only needs 2-4 minutes in the pan, as long as they don’t have a very strong flavor on their own (I tried using cauliflower and didn’t like it very much). This has to be one of the easiest and healthiest weeknight dinners you can cook. It takes about 2 minutes to cut the steak into thin strips and place it in the marinade. You can do that before you leave in the morning or just when you get home from work. When you are ready to eat, the meal is ready in 5 minutes from the time you open your fridge to get the marinated steak. PRO TIP: I usually serve the Marinated Steak and Broccoli over rice or quinoa. A good trick to kick the flavor up another notch is to cook your rice in a little bit of chicken stock (just add a quarter of a bouillon cube) and ground turmeric. This adds a ton of flavor to the rice and makes them perfect for soaking up the marinade. If you don’t feel like steak, you use a very similar marinade to make my Marinated Turkey Breast. Just leave out the soy sauce and add garlic powder to complement the less strong turkey flavor. Mix soy sauce, balsamic vinegar, olive oil, and pepper to create the marinade. Slice the steak into half-inch thick strips and place them in a bowl or Ziploc bag. Pour the marinade over the steak and place in the fridge for minimum an hour. Clean the broccoli and divide it into small broccoli “florets”. The florets should be bite-sized. Put a pan on medium-high heat. You can test when it’s hot enough by adding a few drops of the marinade to the pan. If they immediately start boiling, the pan is hot enough. Fry the steak and broccoli in the marinade for 2-4 minutes, depending on how well done you like the steak. Test a piece of steak with a knife after 2 minutes to see if it's done. Take off the heat and serve right away. Love your recipes. I have recently been diagnosed with Type-2 Diabetes and having found this site and your recipes is a life saver. Just one question. For those recipes that don’t indicate a serving size should I just assume they are one serving.. .i.e., Marinated Steak with Broccoli. Is that recipe for one serving?